We are the top-rated providers of Samsung SF-750 laser printer cartridges at the most competitive prices and also award winning customer support. You'll never have to spend a lot to order brand new Samsung laser toners with our company. You don't need to spend time hunting for Samsung SF-750 cartridges down on the high-street and forking out more. To get the lowest bargains together with our award winning customer services, choose us! Have comprehensive satisfaction if you order replacement Samsung SF750 toner with Cartridge Save courtesy of our company's extensive money-back scheme. You should remember that each order comes with 100% free delivery, almost always arriving the following business day. Samsung created the SF-750 mono multifunction printer for small businesses that need a workhorse for their messaging needs. The SF750 is a digital plain paper fax machine with a high-end laser print engine. It is quite speedy and reliable. The Samsung SF-750 laser fax machine could be a perfect choice for a busy home office, but some users say that it lacks a few essential features. 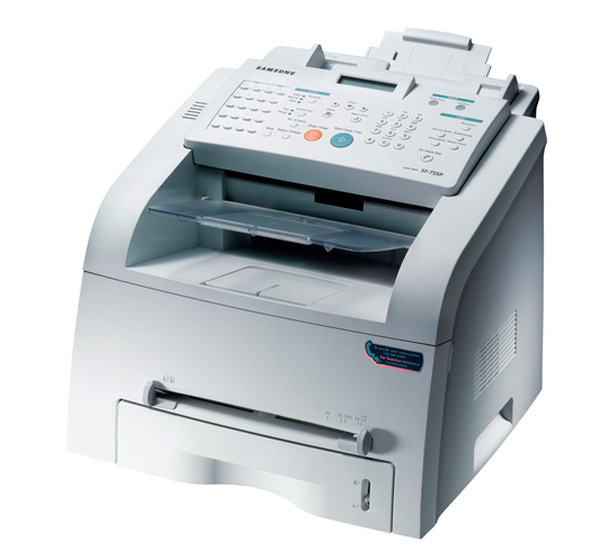 The Samsung SF-750 fax printer doesn't deviate from the boxy appearance, which most laser fax machines have. It boasts a fairly compact frame that measures 13.2 inches tall, 16.4 inches deep, and 15.4 inches wide. The topmost part is slightly angled for an easier view and access to the control panel with the 2-line, 16-character display screen. The Samsung SF750 laser fax is integrated with 5MB of standard memory. Up to 250 sheets of paper can be loaded into the standard input tray, while up to 50 sheets are supported by the output tray. The G3-compatible fax machine of the Samsung SF-750 is fully-featured for fast and convenient receiving and transmitting of messages. The built-in memory can store up to 400 pages and there is an error correction mode feature. Transparencies, cards, envelopes, and labels are also supported by the Samsung SF750 fax machine. There is an automatic document feeder for 50 sheets. The cost of consumables can be lowered by installing a cheap compatible Samsung SF-750 fax toner into the printer which can replace Samsungs toner without compromising the quality of output. The Samsung SF 750 fax lacks finishing features. There are no options for expansion, making it unsuitable for a growing business. It needs a larger display screen, too. The Samsung SF-750 laser printer can only copy and print in monochrome, and it doesn't offer automatic two-sided printing.